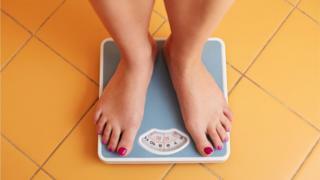 You don't have to be diagnosed as obese to be at risk of dying from illnesses related to excess weight, a global study suggests. The paper, published in the the New England Journal of Medicine, said the findings highlighted "a growing and disturbing global public health crisis". "People who shrug off weight gain do so at their own risk - risk of cardiovascular disease, diabetes, cancer and other life-threatening conditions," said Dr Christopher Murray, author of the study and director of the Institute of Health Metrics and Evaluation at the University of Washington. "Those half-serious New Year's resolutions to lose weight should become year-round commitments to lose weight and prevent future weight gain." The study, which looked at 195 countries and territories over a period of 35 years, from 1980 to 2015, has revealed that 30% of the world's population - 2.2 billion children and adults - are affected by excess weight. This includes nearly 108 million children and more than 600 million adults who are categorised as a having a BMI of higher than 30 and therefore medically defined as obese. Obesity has been increasing around the globe since 1980, doubling in more than 70 countries. The United States has the highest level of obesity among adults and children, at nearly 13% of the population. Egypt topped the list for adult obesity, at about 35%. Speaking to the Guardian's Ruth Michaelson last year about the issue of obesity in Egypt, Dr Randa Abou el Naga of the World Health Organization, blamed a lack of "vigorous physical exercise", while dietitian Dr Sherine el Shimi cited the typical Egyptian's "love of sugar". The report also found that the rate of obesity is increasing faster among children than adults. China, with 15.3 million, and India, with 14.4 million, had the highest numbers of obese children. "The problem is not simply a function of income or wealth," cites the report. "Increased availability, accessibility and affordability of energy-dense foods, along with intense marketing... could explain weight gain in different populations." The lowest rates of obesity were in Bangladesh and Vietnam at 1%. "Excess body weight is one of the most challenging public health problems of our time, affecting one in every three people," said Dr Ashkan Afshin, lead author of the study and an assistant professor of Global Health at IHME. The authors stressed the need for intervention to reduce the prevalence of high BMI and its consequences. Tam Fry, chairman of the National Obesity Forum, said: "Governments throughout the world, caught like rabbits in car headlights, become petrified in the face of escalating obesity. Year after year, mega-statistics like these are published confirming that administrations appear powerless to avoid being crushed by them." Dr Alison Tedstone, chief nutritionist at Public Health England, said urgent action was needed in every country the global obesity epidemic was to be addressed. "Our work to tackle obesity in England is world leading and we want to see other countries following our example. "We have set clear guidelines for the food industry to reduce sugar in the foods children eat the most of and will openly and transparently monitor and report on their progress."